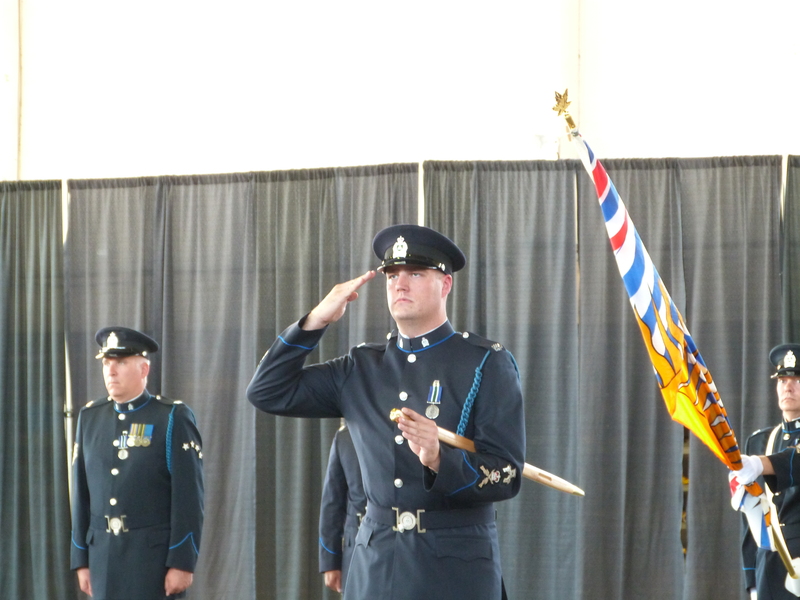 I mentioned recently in a tweet that I’d been quite busy lately and on June 7th the Delta Police and the Delta Police Pipe Band were on Parade to consecrate the new Delta Police flag. 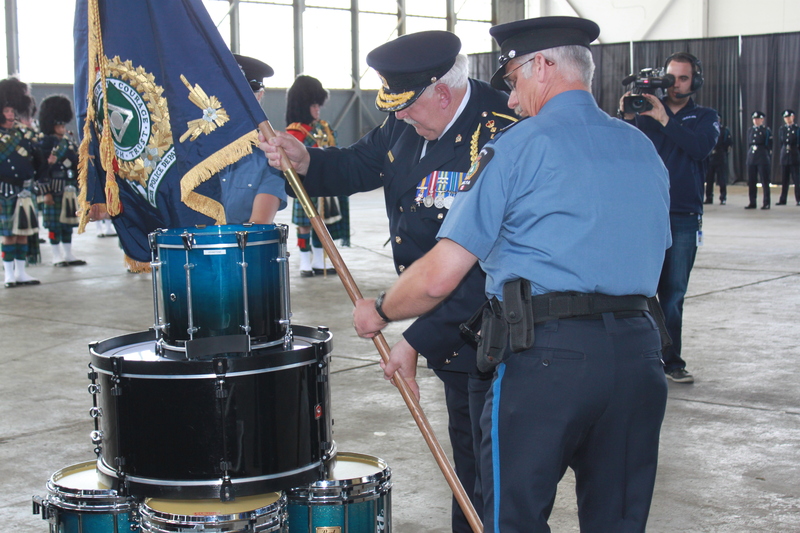 2013 marks the 125th anniversary of the Delta Police Department. We’ve had a new badge provided by the Chief Herald and with that adopted a new flag. Adopting or consecrating a new flag has a long standing Military and para-Military tradition. I was honoured to participate in the planning of the parade and to be asked to act as the Department Sergeant Major and Parade Commander for the parade itself. This year the Delta Police also published a history book “Delta Police: Building on the Past, Focused on the Future”. In that book you’ll see that that both of my parents were also Delta Police officers, my mom leaving the department in 1980 and my dad retiring in 1999. Stepping on to the parade square, leading the department in it’s 125th year on parade with my dad and other retired members I’d met as a young boy in the audience was a proud moment. Having a badge sanctioned by the Queen (her representative, the Chief Herald) is significant. The Heraldry takes into account what is known about us publicly and creates our badge. We become represented by a heraldic symbol, our badge. In medieval times a heraldic badge was used to indicate allegiance to an individual or a family. We use it today to indicate a sworn or affirmed oath to a community and duty. The heraldry also designs and sanctions our flag, using the badge. In medieval militaries, flags (or colours) were issued to regiments and used to organize and represent their soldiers. The colours were traditionally guarded by experienced or elite soldiers of the regiment to prevent it’s capture in battle. 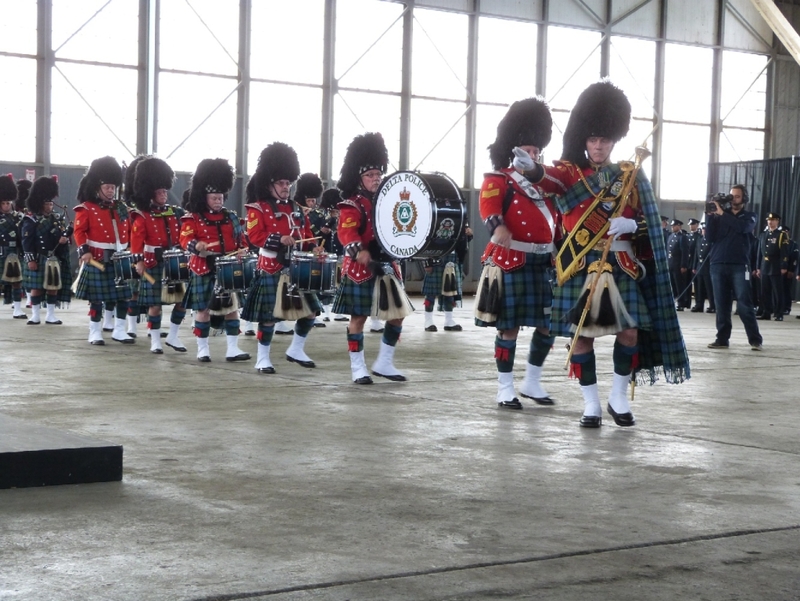 The colours became sacred to the regiments as they represented the honour and traditions of that regiment. Once a heraldic flag is blessed and adopted by the regiment it becomes the regiment’s “colour”. As we have been granted a heraldic badge and flag, our parade is based on the military tradition to bless and adopt the flag as our “colour”. 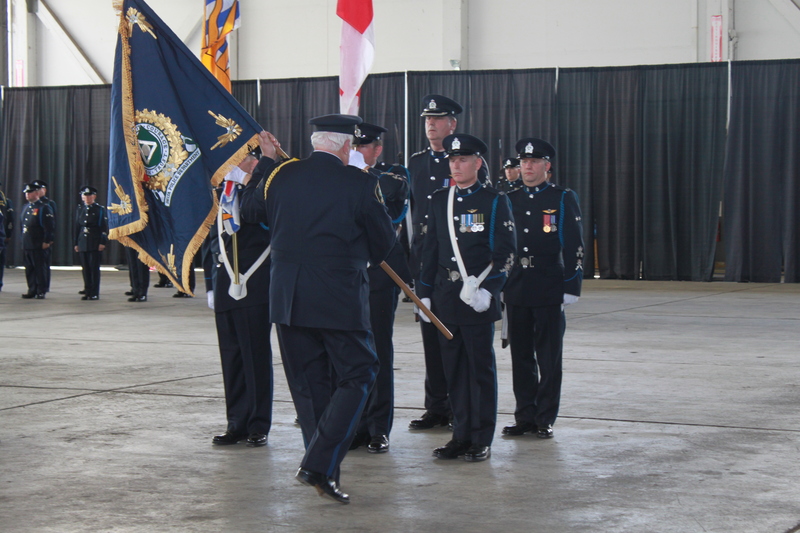 This flag, our flag, represents us, the sworn members of the Delta Police, our honour and our traditions. The Lieutenant Governor’s attendance as a representative of the Queen further ties the Commonwealth tradition to the parade. We will march on to the Parade Square, a ground considered sacred. Our colour party will then march on with 3 flags, the Canadian flag, Provincial flag and our flag. The Canadian and British Columbian flags will be flying. Our flag will be cased (covered) as it can not be flown prior to consecration (adoption). The colours will be accompanied by a ceremonial armed guard. Once formed up, the Vice-Regal party (Her honour, the Lieutenant Governor) will arrive and we will greet her with a salute that is comprised of musical bars from God Save the Queen and O Canada (To signify the duality of her position). The Lieutenant Governor will then inspect our sworn members. After the inspection the parade will march past the platform and her honour. The inspection and march past are long standing military traditions to show off, impress and demonstrate the pride and discipline of the unit. Once the march past is complete, O Canada will be sung and a traditional welcome from the Tsawwassen First Nation will include our community, those we serve with the core values displayed on our badge. The flag consecration will then begin. A drumhead altar will be formed. Ancient regiments would march into battle with their colours and their band. After the battle, a sacred parade ground would be formed (forged and hallowed by the blood of the fallen). Drums would be stacked to create a battle field altar and the dead would be laid out for a funeral service and burial. The Chaplain will uncase our flag. 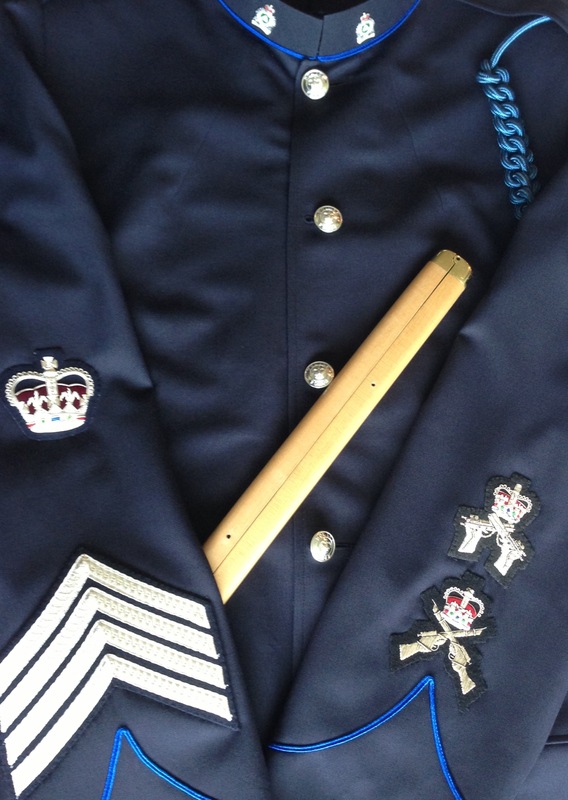 One of the traditions of a regiment’s colour is to honour the sacrifices of the regiment. A scroll with Cst. Mark Nieuwenhuis and S/Sgt. Ronald McKay’s names will be blessed by the Chaplain and inserted into the head of our flag’s flagstaff. 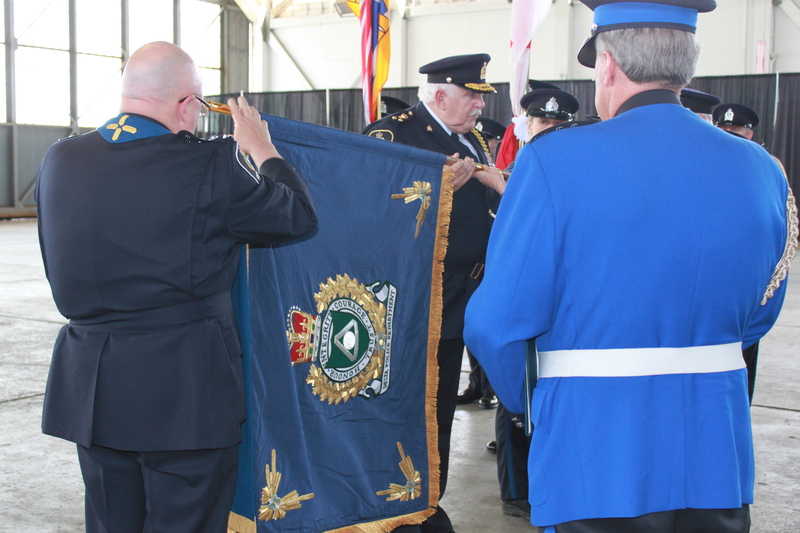 Our flag will then be unfurled (unrolled), officially, for the first time in the presence of the Queen (The Lieutenant Governor as her representative). 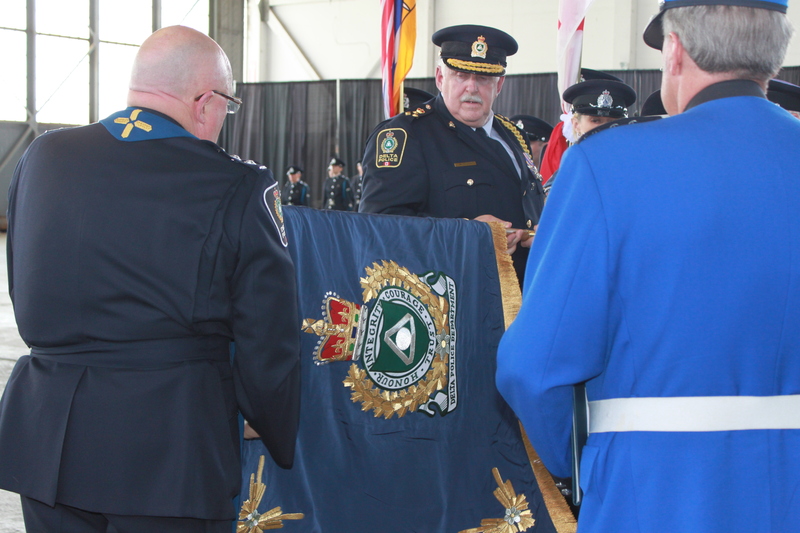 Our unfurled flag, with our blessed scroll will be presented to the Lieutenant Governor who will then present it to our Chief Constable. Chief Constable Cessford will lay our flag upon the drumhead altar. A piper will play the last post, a call to commemorate the loss of life in a public ceremony. A moment of silence will be observed. A piper will then play reveille to signify the dawn of a new day, a new beginning. Chief Constable Cessford will then take our flag and present it back to the colour party. Our flag will become our colour. Finally we will advance toward the platform to signify the close of a parade. The Lieutenant Governor will leave. Our colour party will then be dismissed and will, for the first time, march the length of the parade square, passing the entire parade with our colour flying for the first time. The parade will then be dismissed. The parade is for us, the sworn members, those that served before us and those we will pass our colour on to. We honour our fallen, we respect our past and we represent our future on parade.